Wow, can you believe that Christmas is already only a couple weeks away?! With it being that time of year there are no doubt a few of you who haven’t completed your holiday shopping yet (like yours truly) and are looking for some inspiration for that sports fan on your list. Maybe this is a great excuse to upgrade some tailgating gear. Or maybe you want to support your favorite team by wearing an ugly sweater to your family get together, or adorn your Christmas tree with some team spirit, or perhaps find some great stocking stuffer ideas for the little ones. 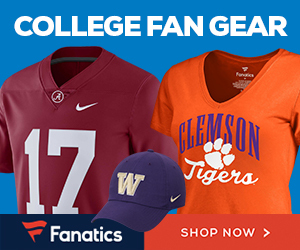 Fanatics currently has their holiday sale going on right now and have some of the hottest buys. Check out some of their options below! If you like what we do here at The Tailgating Spot and would like to support us, you can help us out by shopping through our link to Fanatics. When you make a purchase after you click our link, they will share a part of that sale with us. The ugly sweater bit has really blown up over the years and this season is no exception. It seems like each year the sweaters become more outrageous with their looks and features than the last year. You will definitely stand out amongst your family with a sweater that represents your favorite team AND lights up! Love to be like Santa? Add a little style during your gift giving and show everyone how passionate you are. These Santa hats are machine washable, officially licensed, and can be the perfect accessory this holiday season. Everybody loves opening their stocking on Christmas morning, so surprise the sports fan in your family with the perfect little gift. Tired of the same old Christmas tree ornaments being used year after year? Spruce up your tree this year and show off some team spirit with a new set of ornaments.